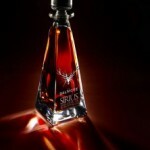 Yesterday, The Dalmore introduced 12 decanters of “Sirius,” a limited edition rate vintage single malt that will retail for a mere £10,000 per bottle. If you want your own, you’ll have to visit one of the World Duty Free stores at Heathrow’s Terminal 5 or be a private buyer dealing directly with the distillery. The Sirius vintage is drawn from a single cask dating from 1951, the oldest remaining in Dalmore’s distillery, which is set on the banks of the Cromarty Firth, north of Inverness. This entry was posted in General and tagged Dalmore by Jim. Bookmark the permalink.